I am a huge advocate of social media. That is stating the obvious, since it is how I make a living. While saying that, I need to say it is not the only tool you should use to market your business or is it? This Forbes article struck a chord with me.Why Social Media Isnt Doing For Us What Londons Coffee Houses Did For 17th Century – Forbes. 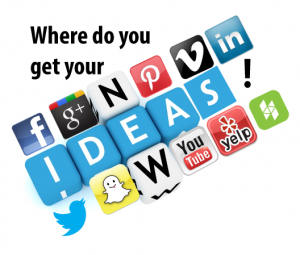 According to the article, using social media may help you spark the creativity and gain the new ideas that you need to be more effective on your job. That is what the coffee houses of the 17th century did. The coffee houses were bemoaned as a waste of time, much like people bemoan Facebook or Pinterest calling them and social media in general a time-sucking black hole. But, how many times have you found the answer or the spark for something that you needed on one of the social media platforms? How often do you turn to YouTube for the how-to of something you need to accomplish or learn? I would have to say frequently. Today in the coffee houses, most people have their faces glued to a device of some sort, so it makes it next to impossible to strike up a conversation with a stranger. Unless you are attending a networking event, you may not meet anyone new or be able to get the spark of creativity. For people like me that work independently, we need a resource for brainstorming. Sometimes I turn to groups on LinkedIn, sometimes, I float around on Pinterest or Houzz for construction ideas. I receive a number of e-news letters that sometimes give me the spark to write an article like this one. 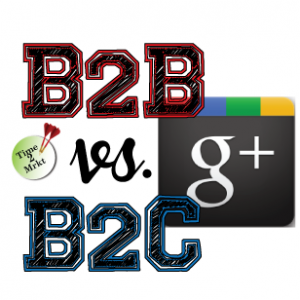 In the continuing discussion about the better platforms for B2B vs B2C – Google+ is next up. Google+ has seen more than a 58% increase in users over the past 9 months. An article from October indicates there are over 300 million users with 1/3 of them in active mode. One of the things about creating a Gmail account is that you automatically get a G+ account. When you have a Gmail account, you connect with all of the other Google services, +, YouTube, Hangouts, Drive, Picasa, and on, and on. Google was a bit late to the game creating a “posting” platform, but with the power of a search engine behind it, Google+ gives you a huge opportunity if you choose to optimize a platform here. Create your company profile and verify your “official” page. Share photos with links back to your website. Recommend links to your blog posts. Use analytics to look at traffic and leads. Use the Hangout function to hold long distance training or brainstorm with colleagues in out of town offices or clients. One of the benefits of Google+ and a brick and mortar location is the map functionality. While G+ is not quite as robust to the consumer as Facebook, the ability to post photos, have images related to your business and reviews about your business may help drive business through your doors. If you have a G+ local business page, you get much more real estate on a search results page. Verify your address to have that show up. No matter which business type you have, you may want to consider establishing a G+ account and putting up a few posts. Engage with others as you can by sharing posts and +1ing posts from others. When people think of video on the internet they almost always think YouTube. But there are other video opportunities as well like Vimeo and Vine. 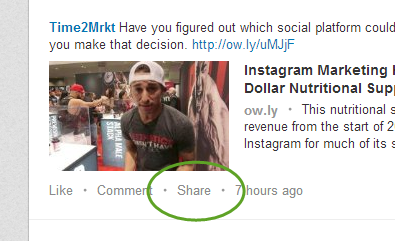 While it isn’t “technically” video, SlideShare can become automated and could function like video. 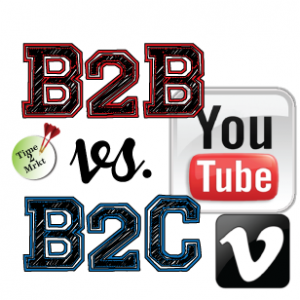 So how does the comparison work for B2B vs B2C – Video? One of the things that I always ask when I am speaking to a group is “Where do you look to find how to do something?” So many people tell me YouTube. That is evident with the 4 Billion searches a day on YouTube. How can you take advantage of that statistic? B2B – in this application, the slight edge goes here because of the how-to aspect of product demonstration, training opportunities, and explaining corporate identity. Take advantage of the 24/7 workhorse of Slideshare or video describing your product or company while you sleep or meet with other clients. 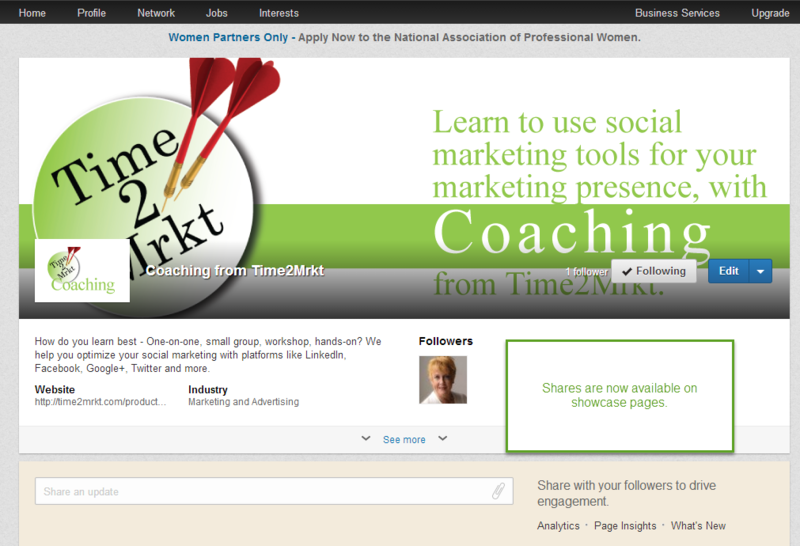 Both tools work in conjunction with LinkedIn which is why I am giving a ever so slight advantage to B2B on this platform. B2C – can you use this platform to “get found” just like so many of today’s musical talents? Video is a great new platform for job seekers to show people some of their skills and imagination. Use video to demonstrate your product or how a consumer can use your product. The second largest search tool isn’t a search engine at all, but is YouTube. How can you take advantage of this Google product to help your business? Have you heard? The products and services page of your company page will be retired on April 14, 2104. 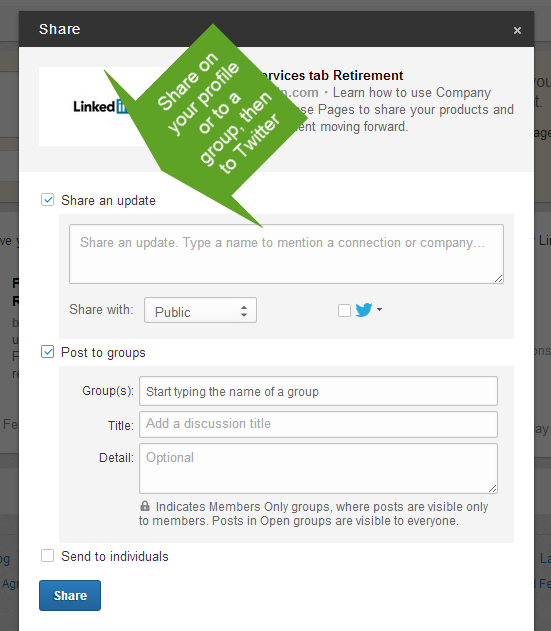 That doesn’t mean you have to stop sharing LinkedIn Company posts, it means you have a new place from which to share! 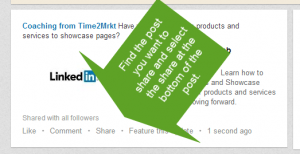 A great thing to do is to post your most recent blog post to your company page. 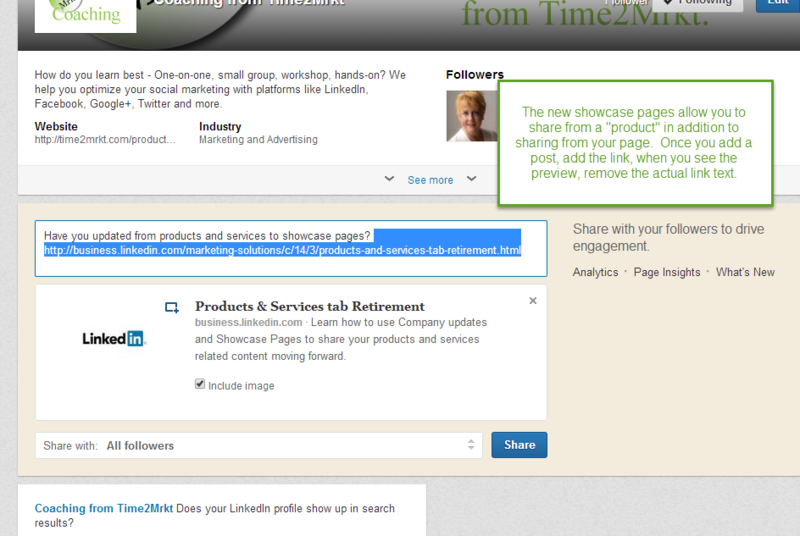 Now with the addition of the Showcase pages, you can post to a specific showcased item. Follow how to share your posts with the bullets here, or follow the images below, or check out the YouTube how-to on my channel. 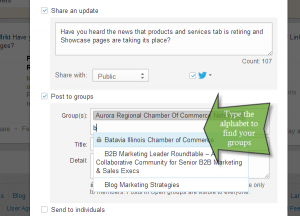 Groups > Type the alphabet and the groups to which you belong will start to appear. If you want to select more than one group that starts with a letter, you have to re-type the letter again. Select Individuals if you wish to notify a specific Individual of a link. They will receive an email about the post. Follow along with the images below. 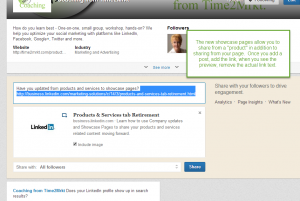 Showcase pages can share items in addition to Company page posts. From the post itself, you select the share option. 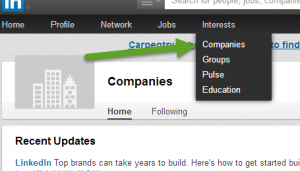 Follow the same steps as for the company page posts. Comment to share to your personal feed. 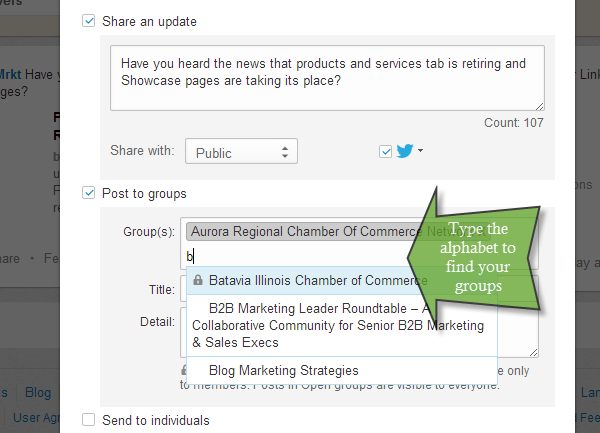 To share to groups to which you belong, begin typing the alphabet and the groups will show up. Select a group. If there is more than one group in a letter, you just type the letter until you have added all the groups that you would like.